The United States is withdrawing more staff from its embassy in Tripoli, some two weeks after cutting personnel to emergency levels following an attack on its consulate, officials said Thursday. Most American diplomatic staff had already been withdrawn from the embassy in Tripoli, after a September 11 militant attack on the US mission in the eastern city of Benghazi killed four Americans, including the ambassador, Chris Stevens. All the staff from Benghazi have been sent home, and all non-emergency personnel were flown home from Tripoli the day after the attack, leaving just a skeleton crew behind. 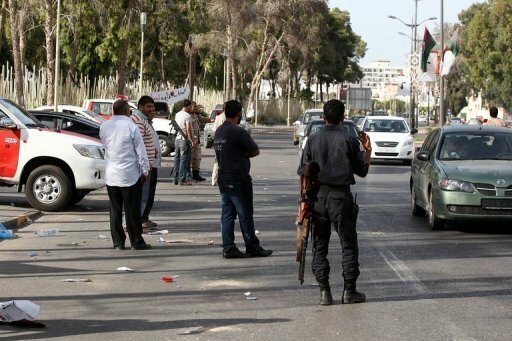 US officials refused to say how many people remained in Tripoli. It is understood though that the drawdown did not effect a detachment of 50 Marines dispatched to secure the main embassy in Tripoli after the attack. A message to US citizens posted on the embassy site on Thursday warned of reports of new demonstrations planned in Tripoli and Benghazi on Friday starting around 5:00 pm local time.